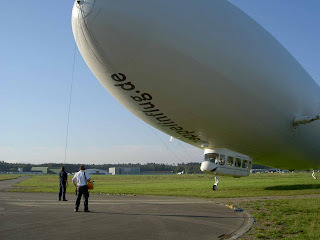 We took many photos on our trip to Zeppelin (as you can imagine). The ship, devoid of most graphics, was taken out of the hangar on a perfect sunny day. It had been stormy the day before and the ship had been put in the hangar that afternoon. During the night, Josef from Airborne Grafix had been removing the Mainau decals in preparation for the application of the new EADS Space logos. 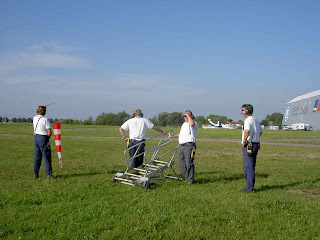 After the first flight, the ground crew stand waiting for the ship to land. Note the limp windsock which dropped just as I took this picture. There actually were a few knot winds on that day. I also like this picture of the ground crew member on the rope, singular. 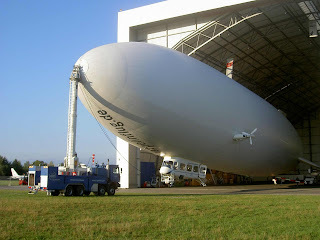 Nice to contrast this to the Zeppelins of old, or indeed modern blimps that need a few more pairs of hands than this.